When attempting to summarise any kit, the question that is always foremost is: could it have been any better? And here the answer is: yes, on more than one count. While there is no doubt that this is a lot of kit for the money, there are too many areas that need addressing. Chief amongst those is the cheap heads, which undo pretty much all of the care and hard work that has gone into creating the kit at a stroke. A remarkable price for a kit of this size. Featuring a design penned by Travis Smith himself. Rubbish heads. You'll need a van and roadie for lugging the kit around. Like Trivium´s ace sticksman Travis Smith, ddrums´ acoustic drums move fast - in the ground they cover and, in the case of the Trivium drummer with his blinding double kick chops, literally. No sooner had Travis been welcomed into the ranks of ddrum endorsees than he was enthusing over an ash Warrior kit being built to his specifications, complete with hundreds of decorative spikes protruding from the shells. In the blink of an eye, a Travis Smith signature snare was being unveiled, which was then swiftly followed by the signature kit we see here. No spikes feature on Travis´s ddrum signature kit, but there can be little doubt of its origins. Consisting of two whopping 24"x20" bass drums, the aforementioned 14"x7" signature snare, four rack toms - 8"x7", 10"x8", 12"x9" and 14"x10" - and a pair of floor toms (16"x16" and 18"x16") it is emblazoned with a design graphic penned by Travis himself. Production of the kit is limited to 100 sets, of which just 10 are allocated to reach the UK. Perhaps the most impressive thing about this kit is its price, which is pretty remarkable for a kit of this size, let alone one sanctioned by one of the hottest players out there. Rather than being based on a single ddrum range and then tweaked to Travis´s liking, this signature kit contains elements from various ddrum ranges, with several unique features thrown in. The shells are made from a combination of basswood and birch. The now discontinued ddrum Diatribe range featured all-birch shells, while the existing Diablo line is formed with basswood shells and the signature kit shells are a new composite of the two ranges. In terms of construction, the toms and bass drums share a nine-ply sandwich at just over 7mm thick, while the snare drum´s altogether meatier 15 plies come in at 14mm. 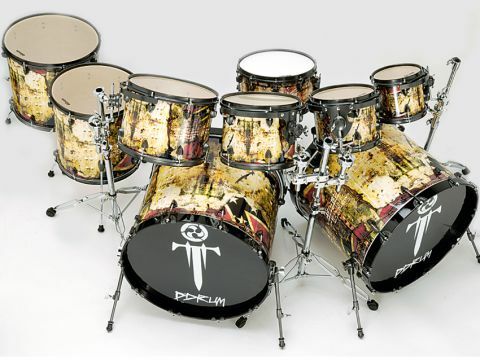 The finish takes the form of a wrap that Travis designed with the aid of ddrum´s graphic artists. Custom wrap specialists Rockenwrap were also enlisted at this point and the resulting pattern - called Rebel Rust - flows across the drums coherently. Featuring barbed wire motifs and sections of the Confederate flag along with a Trivium ‘T´ over a pale yellow/green background studded with rivet marks, it puts Travis´s personal stamp on the kit. "The most perplexing aspect of the kit is the choice of heads. Travis is an Aquarian endorsee, so there was a huge opportunity there for the taking by the two companies. Instead the kit is fitted with generic clear heads that are evidently only fractionally thicker than a cigarette paper". Neat shield-shaped lugs are fitted on all the drums, with a healthy distribution of lugs per circumference on each drum. The lugs were sourced from the former Diatribe range, but the galvanised finish they are coated with is unique to this kit. All of the rims and suspension tom mounts are similarly adorned with this gunmetal grey finish, which is called Warrior Coat. It does give an aggressive look to the shell hardware, but at the same time is eerily similar to the Hammerite paint that careful houseowners apply to guttering and drainpipes for its life-prolonging properties. As with all unusual finishes, visual inconsistencies reduce the impact. The tuning rods, for instance, gleam away in standard stainless steel, as do the floor tom legs and all the wingnuts on the kit. Even the tom suspension mounts feature rivets that have been added after the painting process. The result seems hasty and not properly thought out. More worryingly, when we were putting the kit together we came across one too many threads that needed a little persuading to screw in. That´s most unusual these days, and we wonder how many lugs on Travis´s own kit have required re-threading after a life on the road. No stands are supplied with the kit, but four ball-and-socket tom arms, complete with clamps to attach them to cymbal stands, are included. They are Warrior Coat free. The most perplexing aspect of the kit is the choice of heads. Travis is an Aquarian endorsee, so there was a huge opportunity there for the taking by the two companies. Instead the kit is fitted with generic clear heads that are evidently only fractionally thicker than a cigarette paper. Even looking at them, it´s obvious that they are cheap and substandard. An inexplicable decision. We began with the enormous bass drums. Unsurprisingly, they are big sounding with a clear emphasis on bottom end. Other than that they didn´t reveal a great deal of character. Their vast length ensured that there was no attack at the top of each pedal stroke, just a huge, deep wallop. They were also intriguingly dry, to the extent that only minimal dampening was needed. The thick-shelled snare gave a tight, hard crack that had no problem cutting through. Its die-cast rims ensured that rimshots really bit and kept any ringing within reason. Again, little in the way of dampening was required and it sat well with the bass drums. In fact, the kick and snare combination would be as at home in experimental dance or industrial music as the metal it was designed for. The wonderful array of toms bore the brunt of the poor choice of heads. The rack toms were reduced to rototom-like ‘boing´s, with only the floor toms producing anything resembling the growl that they are so surely capable of. Fitting branded heads to a couple of the toms brought an instant improvement. There is no disguising cheap heads - up to 80 percent of a drum´s sound comes from the head - so to leave six drums out of a nine-piece kit so vulnerable to criticism is an extraordinary oversight.